Auto Bahn of Genesis (AHR 32747-13) was born on May 3rd, 2013. ‘Enzo’ is sired by the AHR GOLD Classified, 3-time AHR ‘National Champion Stallion’, Alfa of Genesis. Enzo’s dam is the AHR GOLD Classified mare, Angel of Trisanna TOF. Angel’s sire is the Austrian stallion, Walzertakt, who stood in the United States for two years while he was on loan from Austria. While in the U.S., Walzertakt became the sire of many notable offspring and Angel is one of them. Angel’s dam, Ariffa TOF, is herself an Austrian imported mare. Ariffa was the highest selling filly at the sale in Ebbs, Austria in 1998 where she was purchased by Tudor Oaks Farm and later imported into the United States. In 2000, Ariffa was named the AHR ‘Junior National Champion Filly’ and went on to be named the AHR ‘Reserve National Champion Mare’. In 2002, she was the AHR ‘Senior National Champion Mare’ and went on to be named the AHR ‘Grand National Champion Mare’. Ariffa was AHR Silver Classified with 79 points. Angel was AHR GOLD Classified in 2006. Angel was the only horse to be AHR GOLD classified that year. Auto Bahn of Genesis is the prized result of an elusive AHR GOLD x GOLD cross! 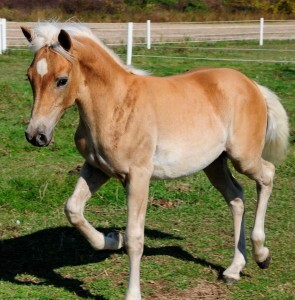 Enzo will be a very tall and modern haflinger with a swooping neck and his parent’s metallic gold color. His steady temperament and his lofty gaits will make him a fierce competitor in the dressage ring. Enzo placed 3rd in the AHR Futurity ‘Junior Weanling Colt’ class. His ¾ brother, Avion of Genesis, won the class. In the competitive SIP Pleasure class, Enzo placed 9th out of over 20 entries in the class. His placing helped to earn his sire, Alfa of Genesis, his second AHR ‘Stallion of the Year’ title in 2013. Enzo was gelded and sold after the 2013 show season as a dressage performance prospect.